Over the last few weeks I brewed the three "treads" for my Cable Car clone. The Avant Garde clone is finished fermenting, the Saison yeast is taking its time to finish the Red Barn Clone, and the Amigo Lager clone has just started fermenting. I have to do this a bit faster than I wanted to so all the beers are ready for secondary by the time I leave for the holidays. Ideally I would have time to lager all of the beers for a few weeks after fermentation to clean them up before I add the funky microbes. After losses to sampling/transfers I hope to have about 5 gallons going into secondary. They will get a bit of time to lager and drop out any yeast/protein, I'll rack again into a 5 gallon better bottle and add a blend of souring/funky microbes. Sadly I don't have the actual microbes that Lost Abbey uses, but I do have a blend that originated at Russian River. After a year with the bugs and .75 oz of Medium toast French oak I plan on bottling. 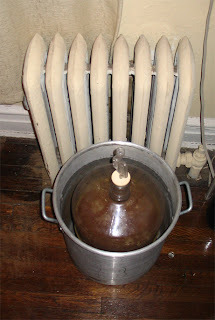 12/29/07 Left it in MA in an inside closet, left airlock on and beer near top of the carboy. 4/25/08 Airlock filled up with a gross mold. My father cleaned it, but left it dry for a couple days. 7/21/08 Added 1 oz of the Lost Abbey Red Poppy oak cubes because the beer was tasting rather bland (not much sour, not much funk). I may feed it with some DME in a month or so if it still needs help. 8/11/08 Was getting pretty oaky, so I racked it off the oak and added 3/4 cup of light DME boiled in a bit of water. 10/02/08 Update, looks like a decent krausen/pellicle is forming on the surface as a result off the DME. 12/26/08 Bottled with 3/4 cup of table sugar and some 71B-1122 (wine yeast). Tasted pretty good, nice citrus component, but still not as sour as I would have liked. If you want the details of how I came up with the recipe check out this. 4/15/09 First tasting, doing pretty well. 1/03/10 Second tasting, alongside an actual bottle of Cable Car. The results were pretty close, but I would add the microbes sooner to boost the acidity and tone down the honey malt and toasted malt in the Avant Garde portion since mine was maltier. Have you considered trying to clone the Mad Elf? I tried last year but with mixed results, too much honey and too little cherry, but the cherry provided stupid amounts of alcohol. I shall try to dig out the recipe again. Mash at 152 or so to leave some sweetness as the honey and cherries will dry the beer out a bit. Belgian Yeast of your choice start it cool and let it rise on its own. I think 5 lbs of cherries would be enough for secondary, Mad Elf has some cherry flavor, but it is not as overwhelming as many fruit beers. Here are the two threads, the recipe seemed to generate positive reviews. You may want to put up a post looking for updates. If you end up brewing it please let me know how it turns out. WE HAVE PROCURED THE CORRECT MALTS AND HOPS. Well sort of, we used German Munich, and instead of Pils we used Munton's extra-light. The other guy is using Munton's Light. The yeast I'm using is the Belgian Strong, Travis is using a triple. For cherries I'm going to try to get locally grown cherries if the farmers market is still open - we have a place up here. I may also add a maraschino cherry for color and to ensure my liver is good and fucked. ;) I dunno what Travis is doing, but you asked to be posted if anyone attempts this so here we go. I think the tab so far is $50, I'm hoping it's worth it. I've got to get this all-grain thing going - it would have been half the price (Dingman's Pils @ 1.6 Lov crushed is $1.70/lbs). Do you use the outdoor burner or a stove top to mash? Glad to hear you are going to brew it, best of luck. It’s a big beer so just make sure to put some extra effort into a big yeast starter and plenty of aeration before pitching the yeast. All-grain is a real money saver (my last two bags of imported malt were under $.70 a pound, although I’m sure the next ones I buy will be considerably more with the recent malt price hike). But even at $50 for a batch, you’ll get two cases for the price of one. You could also try splitting the batch for variety, half with cherries and half with a different fruit. I just bottled the second half of my Flanders Red which had been sitting on blackberries (cherries were my first choice, but the local farmers market was out that week) for 4 months, tasted great from the bottling bucket so I have high hopes for it.